Lehigh Southwest Cement Co. announced plans to install an innovative mercury reduction system at its cement plant in Tehachapi, Calif., early this year. The company has successfully installed similar Activated Carbon Injection (ACI) systems at two other plants, including one at its Permanente Cement plant in Cupertino, Calif. 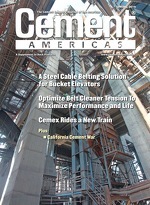 The Cupertino plant was the first cement plant in California to apply this progressive reduction technology. As a result of the ACI system, the Permanente plant realized a 90-percent reduction in mercury emissions. The company expects a similar reduction at the Tehachapi plant once the system is in place. Mercury emissions from cement manufacturing are primarily attributable to the naturally occurring concentrations found in limestone, the key raw material needed to make cement. Traces can be found in other local components as well, such as silica, and the plant had already taken steps to replace that material from the site with silica purchased from an outside source. “Lehigh Southwest Cement Co. is serious about environmental sustainability and we are committed to working closely with the communities where we operate,” said Alan Rowley, plant manager at the Tehachapi facility.